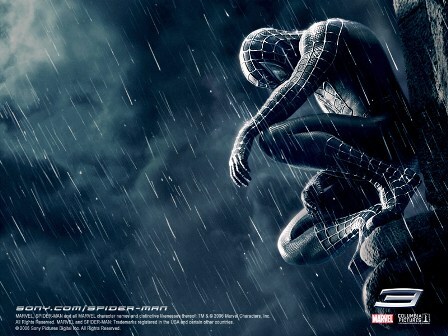 Spider-Man 3 is the upcoming and the third movie in the SpiderMan film series that based on the fictional Marvel Comics superhero Spider-Man. Spiderman 3, starring Tobey Maguire as Peter Parker (Spider-Man), Kirsten Dunst as Mary Jane Watson, James Franco as Harry Osborn, Topher Grace as Edward “Eddie” Brock, Jr. (Venom), Thomas Haden Church as Flint Marko (Sandman ) and Bryce Dallas Howard as Gwen Stacy, is scheduled to be released on 4th May 2007. The starting of teaser trailer shows Spider-Man waking up, hanging upside down in his now symbiote-coated suit and looking at his non-symbiote suit reflection in a skyscraper window. This entry was posted on Thursday, October 5th, 2006 at 7:50 pm	and is filed under Movie Trailer. You can leave a response, or trackback from your own site. 3 Responses to "Spiderman 3 Movie Trailer (Teaser Trailer)"
If eddie Brock is venom and flint Marko is Sandman, then Harry should be Green Goblin. This will make the movie better. Many webmasters try to apply articles from available substance directories to make visitors to their internet site and make some money. This is mostly main for those who have only begun working as an affiliate for several companions and do not still have any support, yet need to built little niche websites to visitors to their internet site so that they can begin making revenue.